Those who claim that renewable energy can meet all of our energy needs are at odds with a recent study by The National Renewable Energy Laboratory that is purported to be "the most comprehensive analysis of high-penetration renewable electricity of the continental United States," which estimated that by the year 2050, a massive expansion of all renewable energy sources (solar, wind, biomass, geothermal, and hydro) may, in theory, be able to provide only 32 of the 98 Quads of the total energy consumed annually in the United States (80 percent of electricity generation). "I stopped counting at 500, the instances of the words “assume,” “assumed,” and “assumption” in just the first volume of this four volume study. I also counted over a hundred instances of the words “uncertain” and “uncertainty” and fifty five instances of “likely” or “likelihood” in that first volume." "...at such high levels of renewable electricity generation, the unique characteristics of some renewable resources [solar and wind], specifically geographical distribution and variability and uncertainty in output, pose challenges to the operability of the nation's electric system." The colored part of the above chart came from the NREL mega-study. I enhanced the chart in an attempt to show how much energy cannot be generated by renewables. I hope I was successful. Note the small brown rectangles which represent the relatively small solar photovoltaic contribution expected by the National Renewable Energy Lab study. Renewables are increasing but they aren't necessarily gaining ground year after year. Between 1989 and 2011, renewable energy went from being roughly 11% of our energy mix to 10% because fossil fueled energy generation tends to grow as fast or faster than renewable energy generation. A growing number of leading environmentalists have come to the realization that nuclear energy and renewable energy are not competitors. One does not displace the other. Nuclear is for baseload power while wind and solar are used to reduce the fuel bills of gas turbine or diesel peaking and load following power plants. They are low carbon allies in the effort to find replacements for fossil fuels. We should be investing heavily to improve both forms of energy. Neither can do it alone. Neither is a magic bullet. 1) The risks of climate change are bigger than they think. 2) The required scale of an effective response to the problem is bigger than they think. 3) The potential of non-nuclear low-carbon sources isn’t as big as they think. 4) Nuclear isn’t as bad as they think. 5) Renewables aren't as good as they think. Coincidentally, my wife was staying at the hotel hosting this same symposium while visiting our daughter who attends school in Chicago. In an attempt to convey the magnitude of what it would take to replace fossil fuels with renewables, look at the bar chart to the left which represents energy use in the United States (Source). Take a few seconds to scroll down to see all of it. Now, understand that fossil fuels are the source of only about half of all global greenhouse gases. Farming and deforestation account for most of the rest. Item 3 was covered at the top of this article by the discussion of the results of the NREL study. Above I provide as a pie chart, the same data found in the bar chart. Note that roughly two-thirds of all renewable energy comes from corn ethanol and hydroelectric. I'm all for renewable energy, but only forms of it that are not worse in their own ways than fossil fuels. Government mandated corn ethanol consumption is finally hitting its limits. Why an energy source that is composed of roughly 70% fossil fuel per unit volume is classified as renewable is a mystery to me. The European Union is creating legislation to reduce their biofuel (primarily biodiesel) goal from 10% to 5.5% on the acknowledgement that it competes with food and is in many cases more greenhouse gas intensive than oil. The main argument to support corn ethanol is that is displaces imported oil (the energy independence argument). 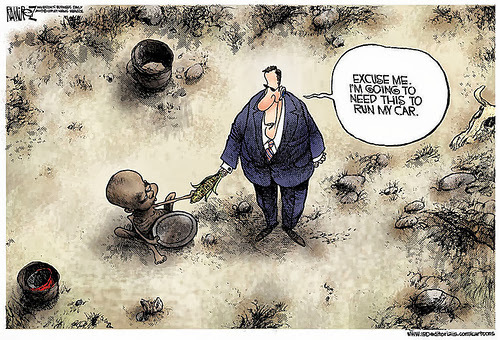 But there is no law against exporting corn ethanol if it is more profitable to do so than to displace oil imports, and wouldn't you know it, that is just what ethanol refiners are doing. There isn't a major environmental organization in the world that supports corn ethanol. Dams are one of the most environmentally destructive forms of energy mankind has ever invented and when you think about it, although precipitation is renewable, dams also don't fit the definition of renewable particularly well because sediment deposits behind dams eventually make them useless in a lifespan that is not much different than some nuclear power plants. I'm also unaware of any environmental groups that support the building of dams. Read Dammed If You Do. You can't dig the sediments out from behind a large dam anymore than you can feasibly dig a giant hole to make a reservoir for a dam. The last straw for the functionally extinct Chinese river dolphin was likely the Three Gorges Dam. New dams are destroying vast areas of the Amazon and also displacing indigenous people. Read Will Mega-dams Destroy the Amazon? The giant catfish, among the planet’s largest freshwater fish species, is now rare throughout the entire Mekong River Basin. While overfishing and past practices, such as dynamiting or electroshocking pools in the river, contributed to the species’ decline, a much larger threat now looms for aquatic life and human populations along the Lower Mekong River: dams. In Washington State, some dams are being torn down in an attempt to halt the extinction of wild salmon species. Here is a great YouTube video of that process. "...effectively ended the traditional way of life of the native inhabitants. The government eventually compensated the Colville Indians in the 1990s with a lump settlement of approximately $52 million, plus annual payments of approximately $15 million." Now look at what remains of the renewable energy wedges in the pie chart without hydro and corn ethanol. ...imagine awaking up every day with hungry kids to fee. A huge, dangerous blender is between your bedroom and your kitchen ...In nesting territories, the mean rate at which hawks encounter turbine collision zones, a 400-foot radius around the blades, is once every 76 minutes. Wind can be quite environmentally destructive when put in the wrong place, which happens far more often than it should because profitability almost always trumps environmental concerns when it comes to energy, regardless of source. It is up to environmentalists to fight the placement of wind farms in environmentally destructive locations and to restrict when they are allowed to spin such as during migrations and when bats are most active. The counter-argument to turbine avian mortality is that because things like cats and windows kill so many more birds than wind turbines do, we should not bother to take any measures to reduce wind turbine bird and bat fatalities. This argument has a few missing links. Significant numbers of bird and bat deaths at wind farms isn't a figment of someone's imagination. No other form of energy kills as many flying creatures per area of land used. Common sense would suggest that 200 mph spinning blade tips up in the air where birds and bats fly will tend to kill more than some structure that just sits there. If wind turbines covered anywhere near the land area of skyscrapers, houses, and roads, there would be nary a bird or bat left alive. While riding a bike on a dirt road leading away from the wind turbines, we found an endangered Galapagos Rail and a common species of Darwin’s Finch within a few miles of each other that had recently been hit by cars. This gave me an epiphany. To put the bird and bat killing potential of the three wind turbines in terms of road kill, picture a 1/3 mile long oval race track in an area known to harbor endangered bird species, with nine equally spaced cars going around it at 180 mph, 24 hours a day (three turbines, each with three 100 foot long blades spinning at 25 revolutions per minute, 5,280 feet/mile, 60 minutes/hour, circumference = 2 x 3.14159 x R). Power lines electrocute vast numbers of birds. Sending new power lines to millions of new wind turbines as opposed to replacing existing coal fired plants with nuclear, requiring no new power lines, would be a much more environmentally friendly thing to do. 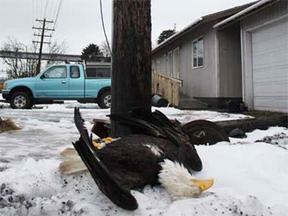 Read Electrocuting Eagles Costs PacifiCorp $10.5 Million. The threat to birds from power lines comes in two forms: electrocution when a large bird comes into contact with two lines or a line and a pole simultaneously, and collisions with the hard-to-see line..."
"Wind power facilities impact birds from direct collisions with turbines and related facilities, such as power lines. Wind power facilities can also degrade or destroy habitat, cause disturbance and displacement, and disrupt important ecological links. These impacts can be avoided or significantly reduced, however, with proper siting, operation and mitigation." ...running the facility in such a way as to protect the bats would require the turbines be "curtailed" -- shut down, essentially -- at night during the bats' active season, about six months a year. That would cost the company an estimated $4 million a year in power it couldn't generate and sell." "We fundamentally reject that choice [the decison by the U.S. 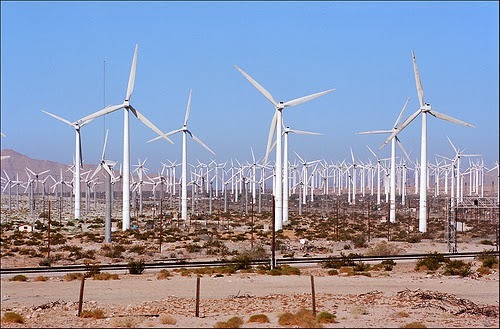 Fish and Wildlife Services to permit the killing of California Condors by wind turbines]. Given the continual technological improvements coming online, the American public has every reason to expect that we can develop renewable energy and ensure that condors will not be killed." Read For the birds (and the bats): 8 ways wind power companies are trying to prevent deadly collisions. Below is a picture of a one of the fastest flying birds in the world, the white-throated needletail, recently spotted in the United Kingdom, and subsequently killed by a wind turbine. See the YouTube video here. "When one turned up on the Isle of Harris, people from all over the country came to see it. 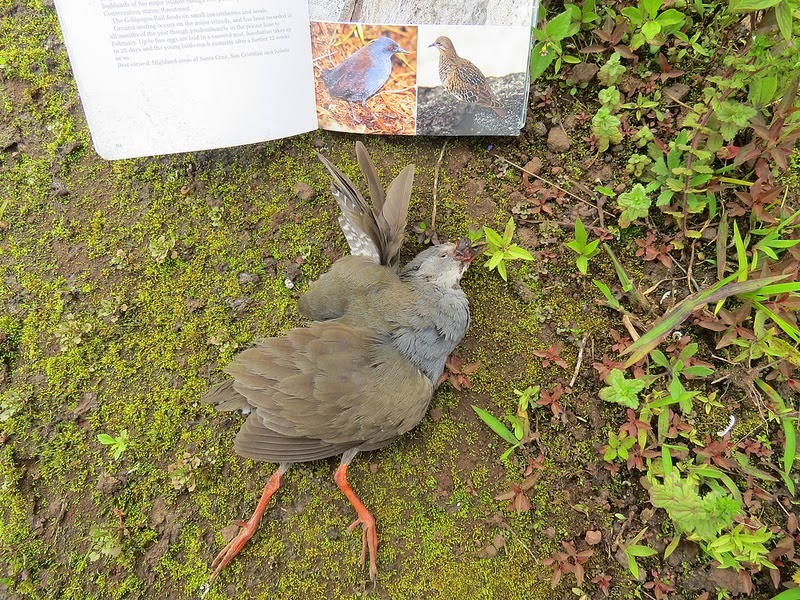 Some were able to get a glimpse of the beautiful bird before it flew right into a wind turbine and died instantly." Surely, wind must be 100% renewable? Well, not exactly. Wind turbines can be thought of as a hybrid component of a modern natural gas power plant. They are connected to the power plant by power lines and serve to reduce the power plant's fuel bills. A wind farm not connected to a grid where natural gas power plants can fire up when the wind dies would be like solar panels on an off-grid house when the sun goes down ...not very practical. Natural gas is a necessary component of wind energy. Think of wind energy as a hybrid between renewable energy and fossil fuels. The National Renewable Energy Lab study had to greatly increase the burning of biomass to get that 32 of the 98 Quads of energy. The British arm of Friends of the Earth and Greenpeace recently wrote a report titled “Dirtier than Coal” which criticizes their government’s plan to burn trees to make electricity. Go here to read for the Natural Resources Defense Council's "Our Forests Aren't Fuel" web page. Allowing forests and grasslands to sequester it (expand area of carbon sinks and/or age of trees). 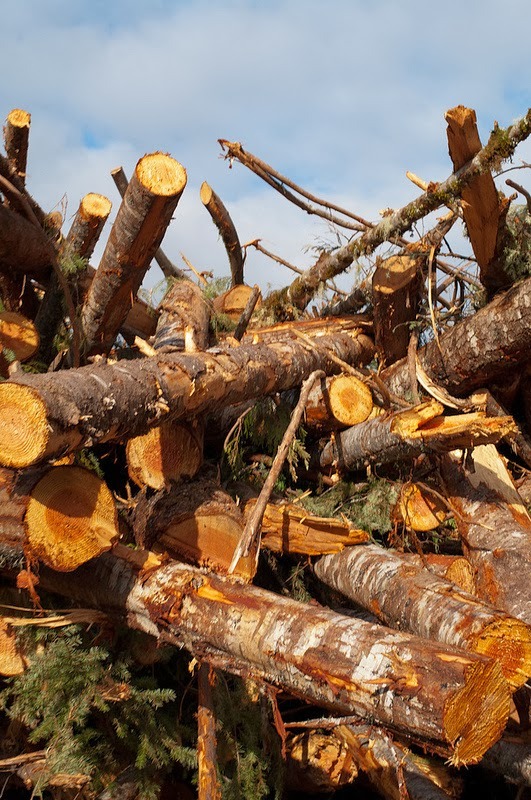 Pay American, Canadian, and Russian timber companies to cut down trees, put them on logging trucks, haul them to seaports, place them on ships to Britain where they will be chipped, dried, and finally burned. I am hard pressed to think of a more ecologically destructive, ham-fisted way to turn solar energy into electricity! Read Replacing Coal With Trees Won’t Scale. 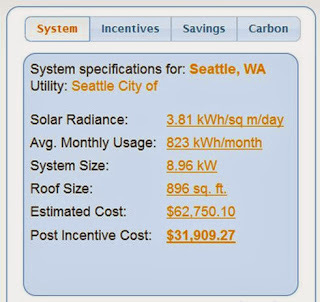 The picture above is a recent estimate I recieved to replace my electricity use with solar panels. It's a low estimate because it does not take into account the fact that my roof slopes East-West instead of to the South. I've always been a huge fan of solar photovoltaic. 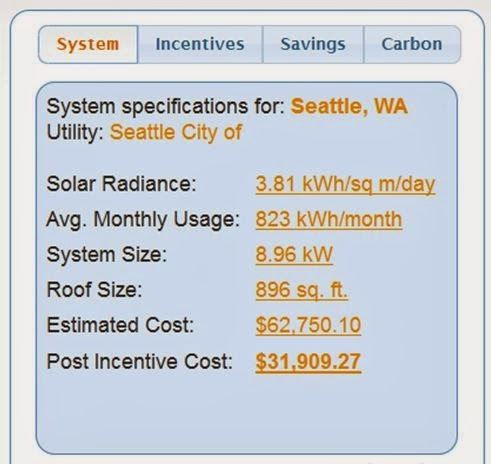 I've never replaced our electricity use with it because of the cost and because I will likely move or die before the system would ever pay itself off. All the same, I may do it anyway one of these days. The estimate was done before I got my electric car. I doubt that I could put enough panels on my house to compensate for that much use of electricity. And obviously, if a high up-front cost and subsidization is an argument against nuclear energy, it is also an argument against solar. The results of the NREL study may disappoint my fellow solar enthusiasts because it suggests that only 13% of that renewable electric energy (roughly 5% of total energy) will come from solar. Distributed solar enthusiasts (who favor photovoltaic solar panels on rooftops) will be further disappointed because half of that 5% will come from water-sucking centralized concentrated solar thermal power plants, many located in desert ecosystems, leaving the other half for solar panels on rooftops, of which many will probably not be on rooftops but in centralized power plants, probably displacing ecosystems or crops. "... the risk to the tortoise is extinction. Translocated tortoises will try to go back to their home range, pushing against fences newly put up to exclude them. Tortoises need to drink, and will use the same drinking site year after year -- a scrape they dig in a hard desert surface that collects rainwater. They have a long-term memory, and if moved will not know where to drink. 50% of all tortoises moved would be estimated to die, due to stress and predation. Also, 50% of resident tortoises at the recipient sites would also die, due to competition with the moved tortoises, and stress. Even 5% of tortoises at control sites would die due to the stress of handling (equal numbers of tortoises must be radio-telemetered in the translocation group, host group, and control groups to compare a population that was not subject to translocation activities). To top it off, the juvenile tortoise population would suffer an 85% mortality rate, because they are difficult to find and move out of harms' way. 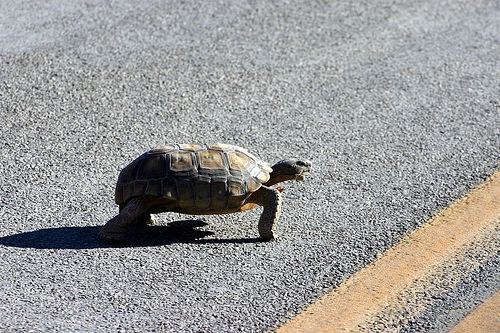 This would happen at every project site where tortoises had to be translocated." Not being biologists ...most people don't get it. The present extinction event is caused primarily by habitat loss. Moving tortoises out of rare, viable, intact habitat, and then destroying that habitat should be illegal. The death of all those tortoises isn't the main point. The main point is the permanent loss of habitat that puts them one step closer to extinction. Like most environmental organizations, the National Resource Defense Council supports renewable energy ...to a point. Read The End of the Calico Project.